Trellis netting is great for training plants along a grid. We usually recommend using the Gro Pro green plastic trellis netting because white, nylon trellis netting often leaves nylon hairs in your plants leaves, buds, and flowers. Vegetable growing requires training plants to their optimal position and size. 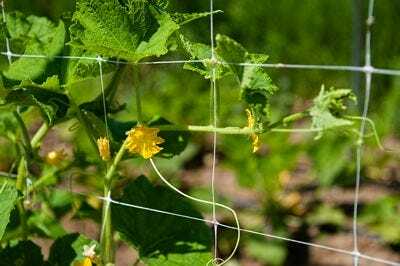 Whether you're growing vertically or horizontally a good support system of trellis netting can support plants in their natural form or use it to train them to maximize yields, harvest faster, and improve quality. Trellis netting usually comes in a variety of materials like soft mesh nylon or heavy duty plastics, select from our many types and sizes for supporting climbing vegetables and cut flowers. Some of the advantages of using trellis netting for controlling the spread of your plants are that it is easy to handle, lightweight, durable and made of weather-resistant nylon made to last. It's a soft, gentle support for stems and vines to attach to while being strong enough to hold all the weight your plants can throw at it. Trellis netting also takes up very little storage space and requires no special storage preparations when not in use, just fold and stow. Garden trellis netting can be suspended vertically like from a roof edge, or it can be draped over an A-frame so it has two angled sides like a tent. It can even be stretched between two upright stakes, forming a straight wall. The main things to consider are how heavy your plants will be, and how big you will allow them to get. With plant management techniques such as LST, ScrOG, SOG, and many others all use or can benefit from trellis netting improving air circulation, exposure to light, and allowing for easy harvesting. LST - Low-Stress Training is a concept to boost your yield and ease the growing process by getting as much of the plant under your grow lights as possible. Two of the most common methods of low-stress training are SOG and ScrOG which are more advanced techniques used to control the growth of your plants each with advantages and disadvantages and are more suited to different situations. S.O.G. - Sea of Green - The goal of SOG is to have as many plants per square foot as possible and then moving quickly to the flowering or bloom stage of growth. Thus creating many smaller plants with large straight up growth and limited side branching. Scr.O.G. - Screen of Green - means to have fewer plants per square foot than SOG as you optimize the available space for one or more individual plants. Resulting in a few or one larger plant with all the side branches trained to grow through your trellis grid getting as much light to as much of the plant as possible.